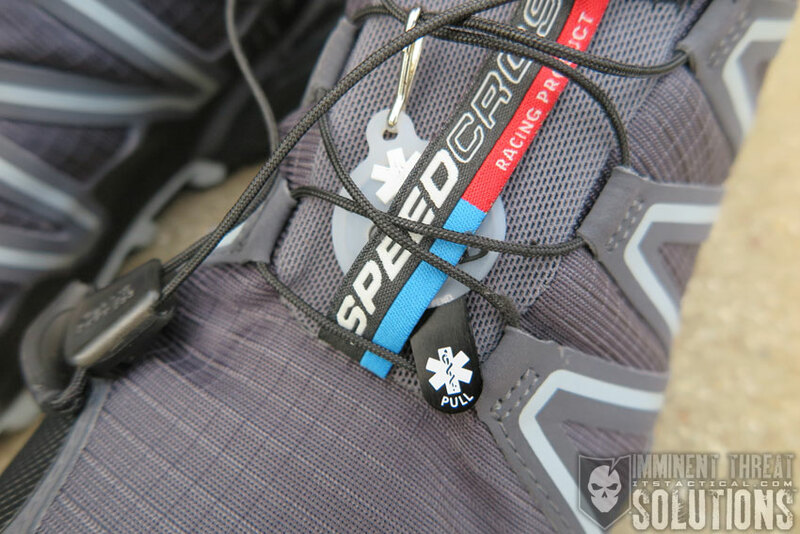 I was given the opportunity last year to attend the worldwide unveiling of the Arc’teryx Technical Performance Footwear line and for the past few months, I’ve been putting a pair of the Acrux FL Shoes (formerly Alpha FL) through the ringer. While my pair of Acrux FL shoes were an advanced sample, I’m happy to say that the production shoe has some modifications that make it even better. 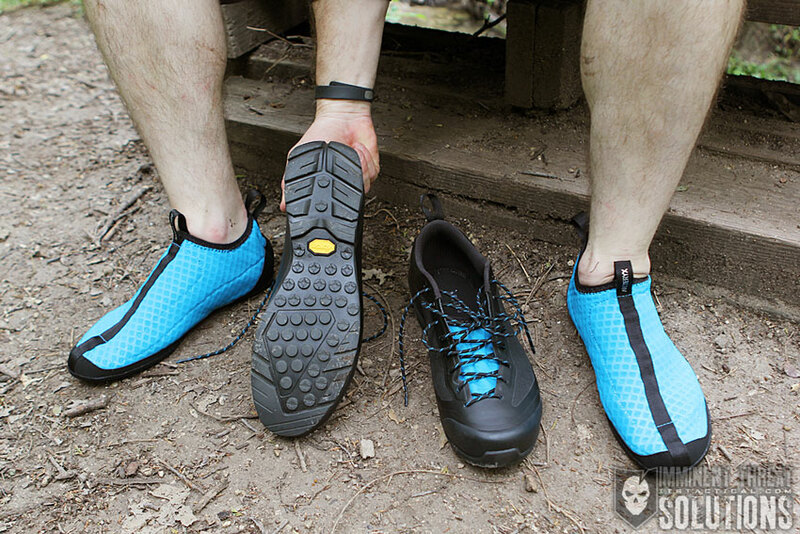 Within the past two months, I was also sent a pair of the Acrux2 FL GTX shoes, which feature the removable liner. You may remember this feature from my write-up on the footwear launch last year. I’ve included notes on these in this review, but at the time of publishing, I haven’t had enough time in them for a proper evaluation. Therefore, the focus here will be on the Acrux FL Approach Shoe. Before jumping into the details, I’d like to go over all the available models to familiarize everyone with what’s out there. Just remember that if you’re referencing my previous article, the “Alpha” nomenclature has changed to “Acrux,” which is how Arc’teryx refers to the low-cut shoes versus the Bora mid-cut boots. 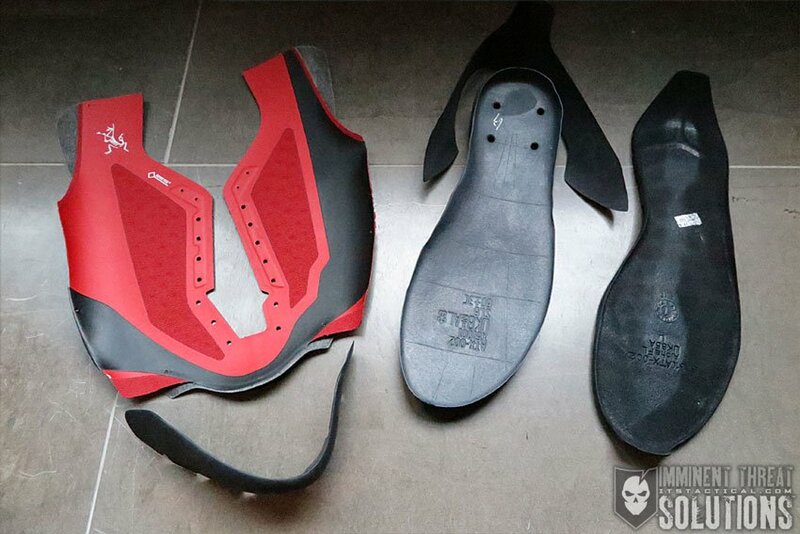 This review won’t include the Bora mid-cut boot options, but I’m looking forward to trying these out as well. There are five primary styles of low-cut approach shoe options, which include the Acrux FL and Acrux FL GTX (with Gore-Tex) in both men’s and women’s versions and the top of the line Acrux2 FL with removable Gore-Tex liner in just a men’s version. Just to note, the Acrux FL and Acrux FL GTX do not have removable liners. First off, I’ll be right up front and address the elephant in the room. 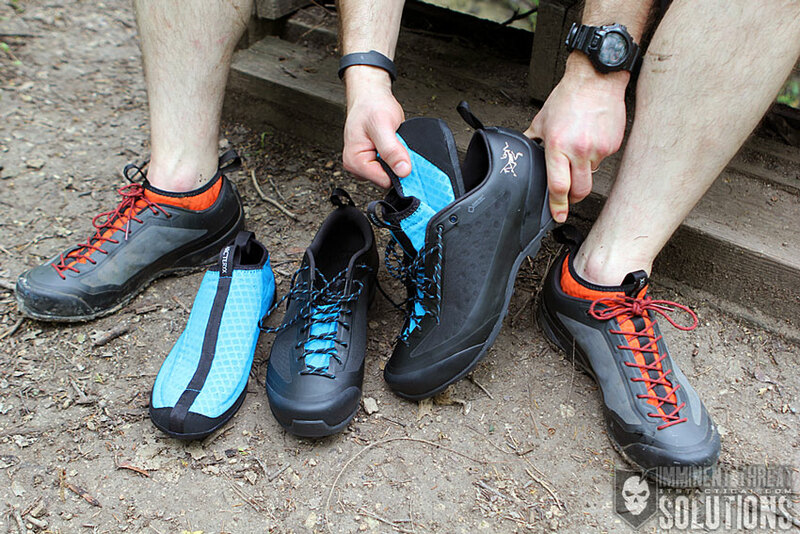 Yes, the two pairs of shoes I’m discussing in this review were sent to me for review by Arc’teryx. Hopefully if you’ve been reading ITS for the past six years, you’ll know that I’m always honest with my opinion of a product, whether it’s been purchased by ITS for review or sent to us. I’m always careful with my endorsement of a product and my opinion isn’t influenced by simply receiving something for review. I usually don’t address this type of information in reviews, but in this case I wanted to be completely up front, as my combined experience with the Arc’teryx Footwear line is something pretty unique. Getting the chance to attend the worldwide launch last June in Chamonix, France provided access to not only get hands-on with the new Arc’teryx footwear, but to also talk one-on-one with the designers and development team that made it all happen. It’s rare to actually see how a product is manufactured and speak to the people that had a hand in brining it to life. Experiencing this type of in-depth access to Arc’teryx footwear has given me a comprehensive perspective on how revolutionary this type of product is to the footwear market. That being said, I was glad to receive an advanced sample of the Acrux FL shoes and get plenty of time in them before writing up my thoughts. It’s only been a little over a month since the Arc’teryx footwear officially launched for purchase, but I’ve been wearing this pair of Acrux FL shoes for around eight months now. Approach shoes by definition are made to get you through challenging approaches to a climb, where you’d then put on climbing shoes to tackle the route. 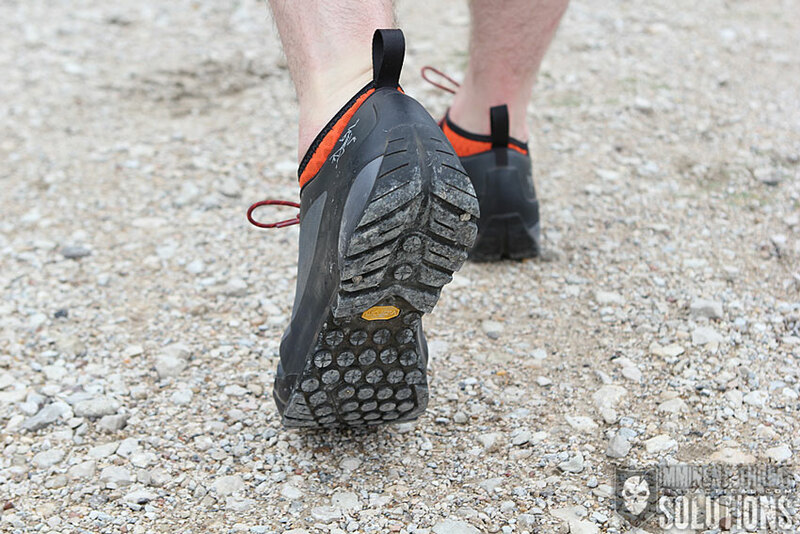 Approach shoes often look like a hybrid of running shoes and climbing shoes, as they need to be comfortable for long distance approaches. Anyone who’s spent time in climbing shoes can attest to their discomfort after hours on the rock. You certainly wouldn’t want to wear your climbing shoes on approach. 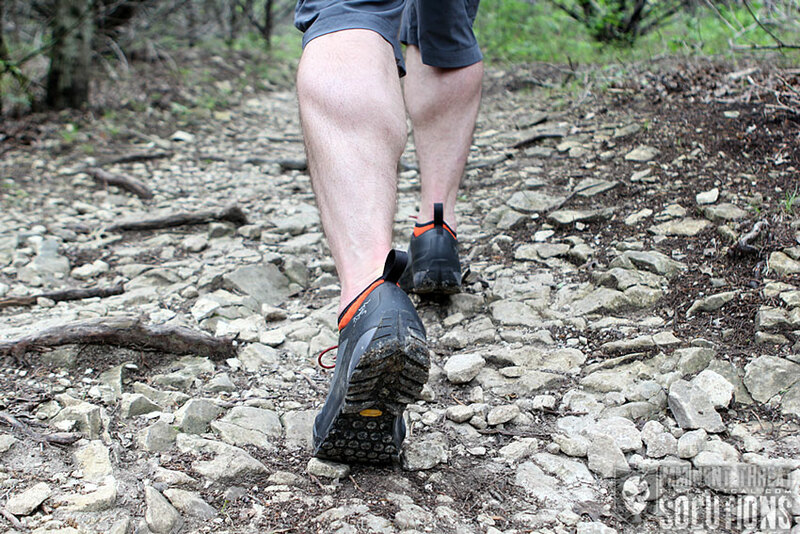 The difference between dedicated trail running, running or hiking shoes is that an approach shoe shares a common characteristic with climbing shoes and that’s a sticky/grippy sole that extends above the toe box and wraps up and around the heel. 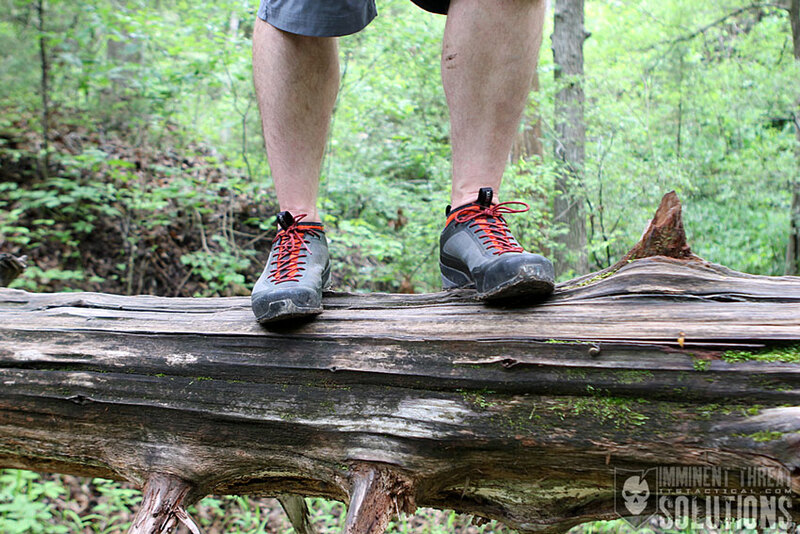 The sole can be particularly useful for light climbing, bouldering and even hiking over uneven terrain. Normally, approach shoes aren’t recognized for their durability because of the abuse they take. 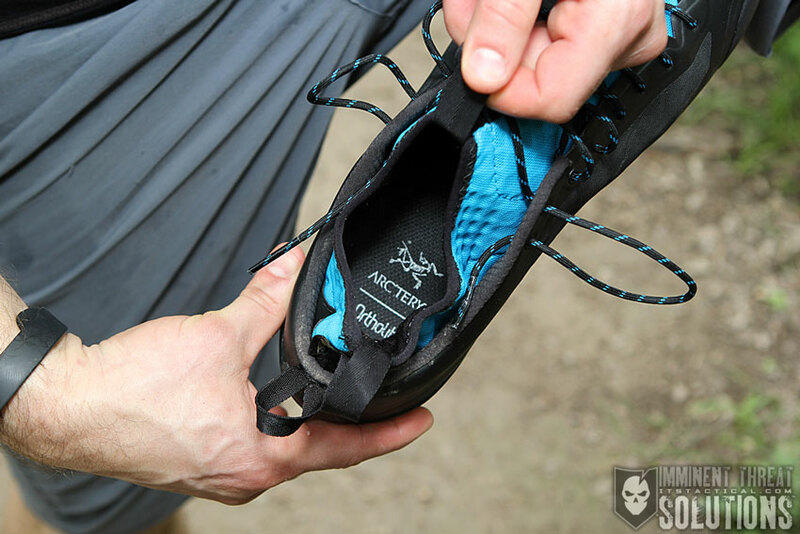 As the Acrux line of footwear from Arc’teryx was designed as an approach shoe, the EVA midsole is also designed for stability and impact protection on varied terrain. This is an important detail and one you might not be used to if you’re not already familiar with approach shoes. The midsole will seem a whole lot stiffer than you might think if not. While the midsole’s role is to cushion and support the foot while still providing flexibility and traction control, don’t discount the Acrux as capable in this role. It’s just less flexible than a typical midsole and that comes back to the purpose built nature of approach shoes. What I’m getting at is that these aren’t your new every day kicks. They’re made for the great outdoors and getting you up and over obstacles on the way to your destination, not getting you up and over speed bumps in a parking lot. As mentioned above, approach shoes aren’t associated with being durable, but Arc’teryx has changed that game. I’ve found the Acrux shoes to be extremely durable, thanks to a seamless thermolaminated one-piece upper that’s actually made from four different layers. 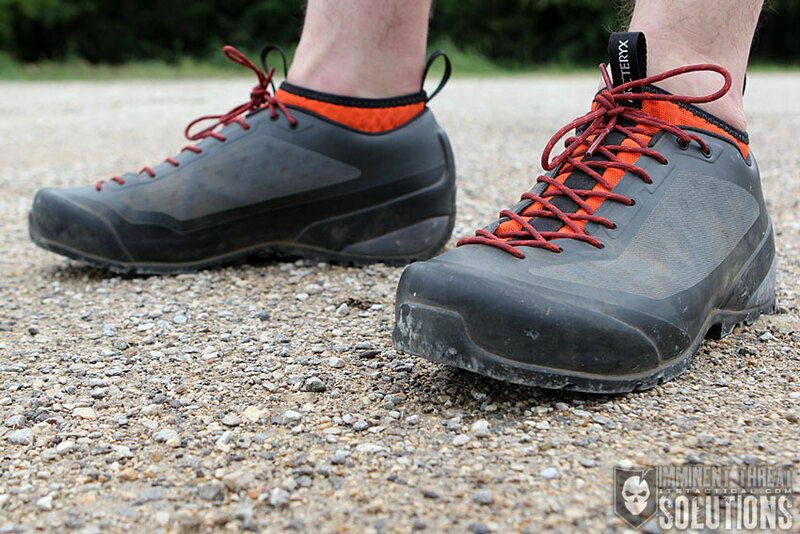 My experience thus far in the Acrux FL shoes has been limited to mud, dirt and rock to test abrasion protection, but I have no doubt that the durability characteristics would extend to the snow and ice as well. I’ll also mention here that the lack of seams means less of a chance of a failure point popping up. 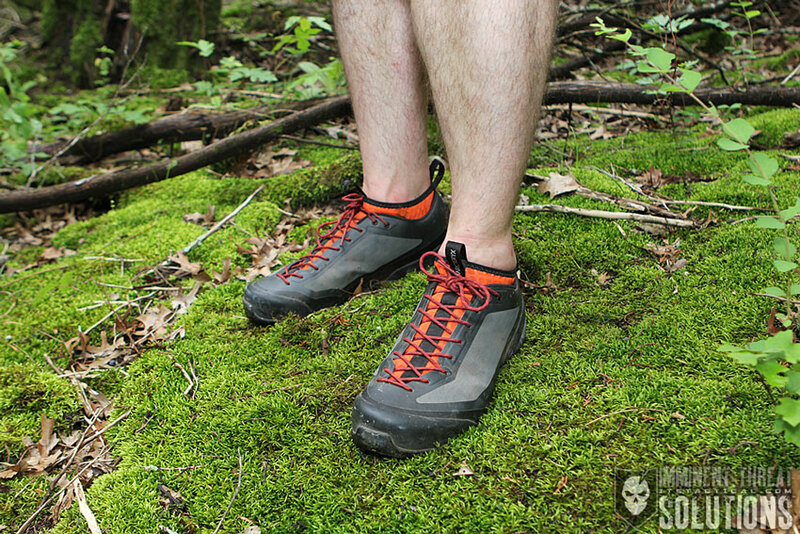 Those that have ever had a seam bust on hiking shoes or boots can hopefully attest to that. Another elimination of potential failure was Arc’teryx producing molded three-dimensional caps that are individually crafted for each size shoe. This resists cracking, prevents collapsing and adds protection to the most exposed areas of the upper and midsole. Sure-footedness comes from working with Vibram to design the Arc’teryx Approach Outsole that combines the grip of a climbing shoe with the stability and rolling stride of a hiking sole. I can honestly these are the best scrambling shoes I’ve even worn too, I’ve had them in conditions that required a substantial amount of scrambling across rocks and boulders, where I saw first hand that the anti-slip lugs lived up to their namesake. Your feet can take a pounding when jumping from boulder to boulder and not only did the Acrux FL shoes stick to the rock, they cushioned my impact very well. 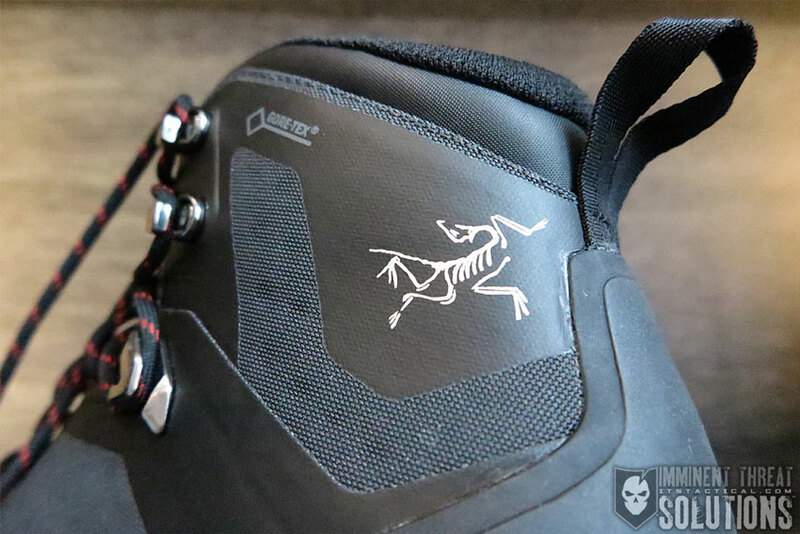 Arc’teryx noted that the Y shape of their rounded heel strike-zone and its assembly without adhesive, allows for each side to flex independently of the overall midsole. This is supposed to better cushion impact on rough, uneven terrain and I found this to be completely accurate. Arc’teryx also custom designed the Ortholite footbed for maximum comfort, breathability and arch support. I really like that Arc’teryx chose to incorporate twin eyelets into the upper to facilitate lock lacing. 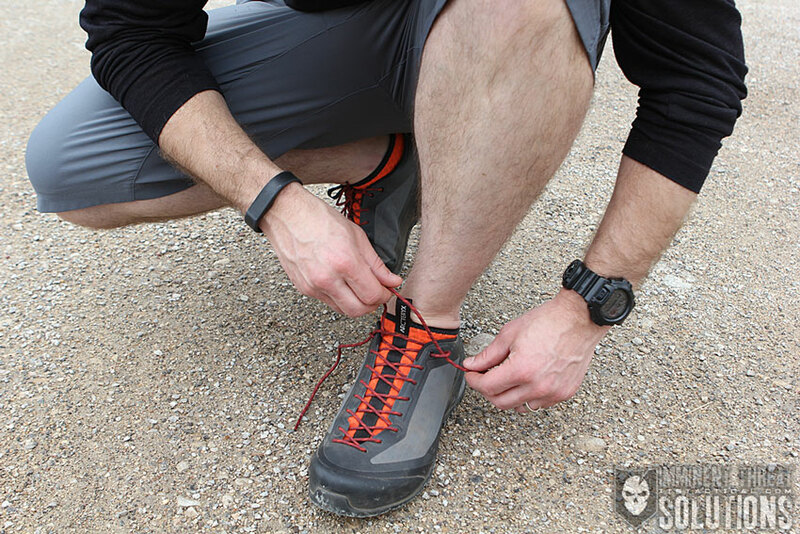 By simply threading the shoelace further through this last eyelet in each side, a loop can be made to run the opposite side lace through to create additional leverage like a pulley. The helps to prevent heel slippage and excessive movement, thus increasing ankle support during technical maneuvers commonly encountered on just the type of terrain these approach shoes were designed for. The comfort level of the Acrux FL shoes is off the charts, I haven’t worn socks once with them and never will. I’ve always been a strong proponent of socks too, especially wool socks. In fact, I bit the bullet a few years back and upgraded all my socks to wool, even the socks I wear with my running shoes. It was a big change for me to try out the Arcux shoes without socks, but I gave them a shot right out of the box. 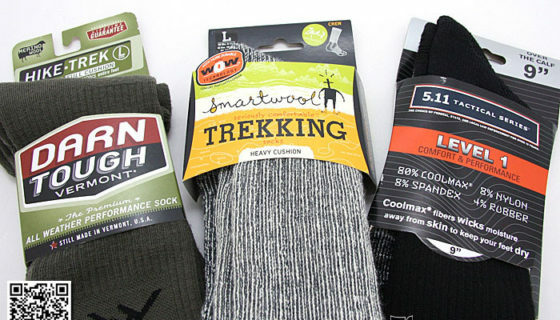 I’ve found that the reason not wearing socks is working really well for me is all thanks to the stretch monomesh liner. Arc’teryx claims that this Adaptive Fit liner “forms to your foot for an exceptional fit with no pressure points and delivers the ventilation required for long days in warm, dry conditions.” I’ve found this to be true not only in warm, dry conditions, but also in humid and wet conditions. Meaning that for me, the ventilation did its job even in wet conditions. Granted I was avoiding the water as best I could, but I feel that the liner excelled here, shedding moisture enough so that my sockless feet didn’t feel like they were sliding around in a layer of excessive moisture. Speaking of water resistance, the PU coated nylon upper is pretty air permeable itself and hydrophobic at the same time, meaning it dries quickly. This is one reason why I actually prefer non Gore-Tex footwear, I’ve always found that shoes and boots I own with Gore-Tex seem to trap more moisture than necessary. 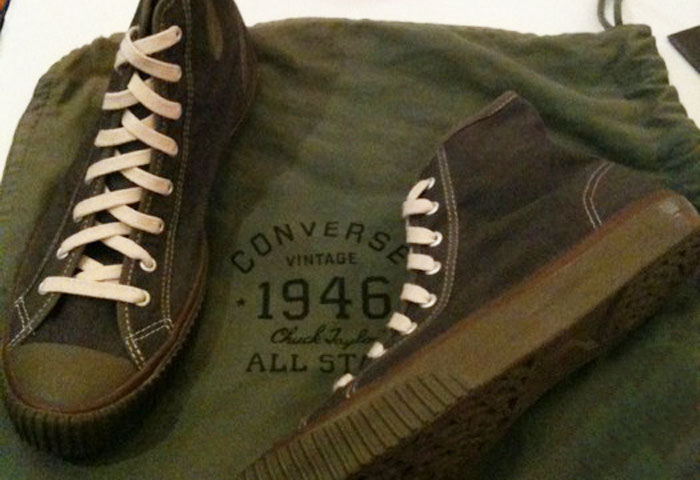 I’m very familiar with Gore-Tex as a material and its properties, I just have my reservations with it on my feet. I am anxious though to get more time in the Acrux2 FL GTX shoes, I’m optimistic that the concept of having the Gore-Tex material in the removeable liner of the shoe and allowing the upper (shell) to remain vented will be superior to traditional manufacturing for footwear. Time will tell though. Just to clarify again, it’s just the Acrux2FL GTX shoes that feature a removable liner, the Acrux FL shoes have a non-removable liner. Something I noticed on the Acrux FL shoes, where that small rocks from the trail would get into the space between the liner and the shoe interior. This wasn’t often, but it did occur. 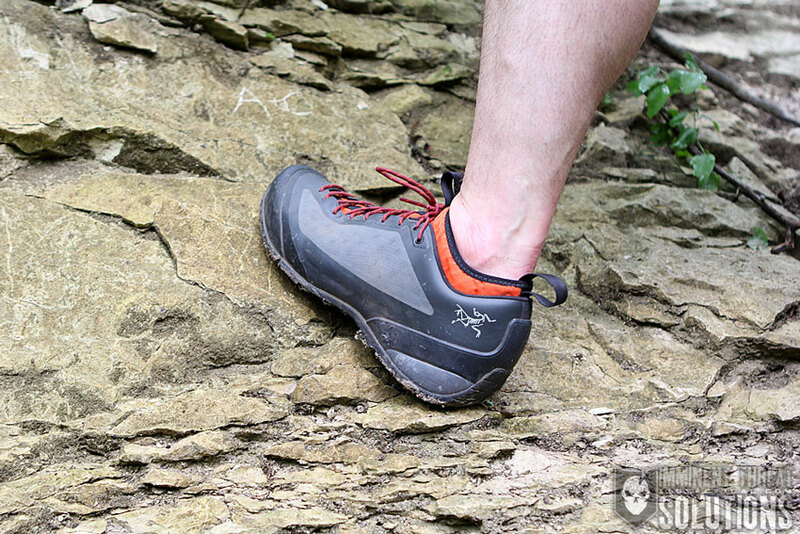 On the production version of these shoes, Arc’teryx added what they call the Rock Stopper. This is a flexible mesh webbing that stretches across the top of your foot to prevent this issue occuring. The mesh runs about 3/4 of the way up, where the tongue of the shoe would normally be. You can see the Rock Stopper in the photo below, it’s the blue mesh still visible in the shell with the inserts removed. I was glad to see this change with the Acrux2 FL GTX shoes and see that it was also incorporated into the Acrux FL production model shoes. I haven’t encountered the issue with my limited use of the Acrux2 shoes. Something else that I want to mention with the Acrux2 FL GTX is that while I’ve been really excited to use the removable liners, there’s been a learning curve. I’ve found thus far that removing my feet from the shoes while keeping the liners on is a bit of a pain. If I don’t make the laces extremely loose when pulling the liner and my foot out, it causes discomfort when putting my foot back in. This is due to the liner getting contorted during insertion and bunching up around the heel. If I’m not removing the liner and it’s just my foot that’s being removed, there’s no issue. It’s not a huge deal, but something worth bringing up. At least for me, it’s meant more time to ditch and don my shoes if I’m using the liners as intended, which is as camp shoes. 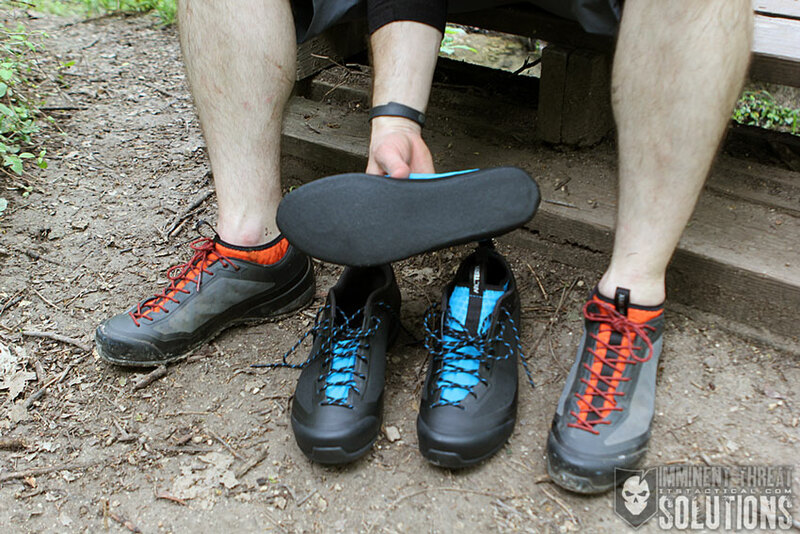 The inserts also have their own rubberized sole that’s thick enough to resist puncturing from most thing you might step on around camp. 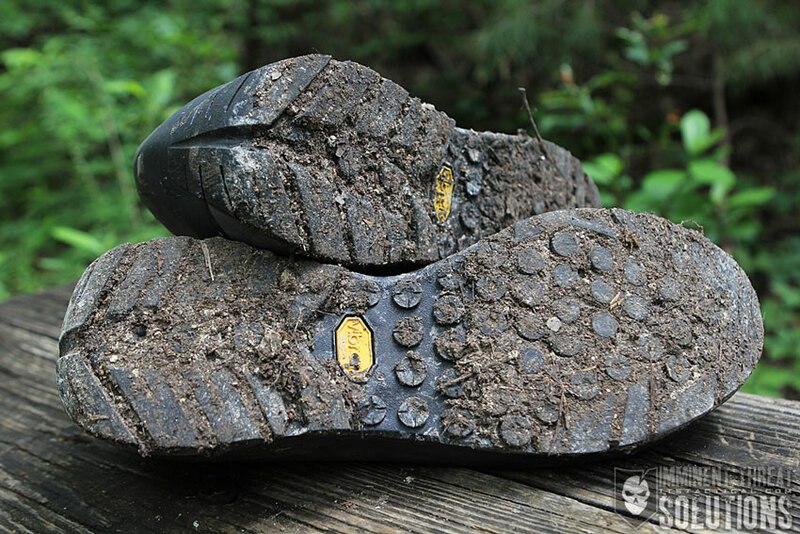 Being made with Gore-Tex means that dirt and other debris won’t get through them too. I’m getting more used to the process of removing my feet with the liners as I wear them, but there just something about being able to untie a shoe and slip your foot in and out with relative ease. I’m just not sold yet on the increased time being worth the versatility of having a removable liner. However, I do see the value of the removable liner potentially reducing hot spots from friction because the liner and outer are moving as two separate pieces. There’s also the option of purchasing the taller mid-cut liners and using them with these shoes for shallow water crossings or to further keep the elements out. Overall the Arc’teryx Acrux FL Approach Shoes are a win in my book and have been added to my quiver of footwear for the great outdoors. 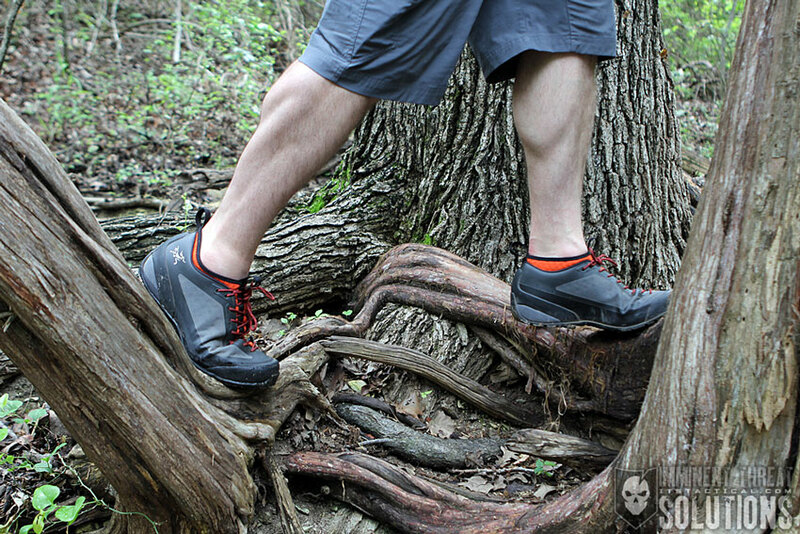 With the caveat to use them as intended, I feel these approach shoes will be well suited for your next outdoor adventure. Check out the full line-up of Arc’teryx Footwear here.